The main function differences between Payroll and Human Resources (HR) is easy to separate. It comes down to the functions that each “department” performs within your business. In Accentis Enterprise, the Payroll and HR functions are the same module. By using permissions and user roles, you can grant access to specific employees. Payroll on the whole concerns paying employees for performing their job as specified. HR handles hiring the correct person for the role they need to perform. There are lots of other differences, but in general, that is how they differ within a company. There are, however, many situations where the roles overlap. Due to this, they are often lumped together within work environments. There are situations that need Payroll and HR departments to be in direct contact with the other. One of those is when a new employee starts work, or someone leaves. Other situations include employees getting a raise for when they get a promotion. It’s also needed when someone wants to take annual or other types of leave, such as PPL. It’s also a simple fact that in some small business environments, the Payroll and HR roles done by the same person. This helps to lower business costs because there is not enough work for staff in each position. Accentis Enterprise payroll is feature-packed with superior functions. It’s an advanced software product that off-the-shelf solutions can’t compete with. Small to medium-sized business operators need a more robust ERP system. The payroll was not actually a function but was the list of employees who needed payment. As technology improved and more factors needed, a payroll clerk’s duties increased. The payroll clerk handles the correct payment of services to employees. This is usually done over a set period of a week, a fortnight or over a month. Other payment types are for casual and commission. Payroll clerks are aware of tax rates for different employment laws and obligations. They need to ensure hours worked and the banking details to pay them. There are other payment types such as child support, salary sacrifice, PPL and fringe benefits. Changes to government requirements also have to be factored in, such as Single Touch Payroll (STP). The payroll department must work closely with the accounts and financials’ department. They make sure the correct figures are used as wages are a cost to the business. The payroll department will also sometimes work directly with employees themselves, depending on workplace policy. Human Resources are responsible for acquiring new staff to the business. Either through people leaving, which they are also responsible to handle, or a new role based on business growth. Using Accentis Enterprise for Human Resources Management (HRM) means that you have access to data immediately after it has been entered. Because Accentis Enterprise is fully-integrated, running reports and sharing data seamlessly means a more efficient workplace. HR is also responsible for the conduct of employees while at work and sometimes when they’re not. This can extend to social media and other outside influences depending on technology or the position they hold. They also need to ensure training is available when needed. If staff are not trained for the roles they have been hired for, this costs money. As does training that is not organised. Company policy is usually enforced by the HR department and built upon as the company grows. Motivation and cultural changes are developed by the HR department to ensure that everyone working for the company enjoys doing so. It’s the aim of the HR department to let the employees shine in their selected role and, where required, help when they want to improve their career. When the role of Payroll and HR in a small business is only performed by a single person, communication is obviously automatic. However, in a small business where multiple employees occupy these roles, communication is key to using these functions. At most times, communication can be handled electronically to send documents and instructions back and forth as required. There is usually no need for documents to be printed and filed, unless a handwritten signature is needed. Because of the sensitive nature of dealing with personal information on every staff member, it’s important that confidentiality is observed at all times. Information on any employee can only be shared between departments as needed, and sometimes on a case by case basis. Within Accentis Enterprise, you can set permissions based on user access. This allows full control over which employees have access to information on their fellow workers. Within Accentis Enterprise, Payroll and HR functions work together easily, as they do with other modules. Due to seamless data sharing and full-integration throughout Accentis Enterprise, even more is possible. Payroll’s financial requirements are easily shared with the financials and accounts department. Financial reports can be viewed and be accurate whenever a financial decision has to be made. While Human Resources are not directly linked to financial considerations within the business, Payroll is the bridge that connects them. This is why in a micro to small-sized business, it can be the responsibility of a single person to manage the Payroll, HR and Financial department on their own. In some cases, this is also part of the business owner’s role. Payroll and HR also link with Manufacturing and Time and Attendance, as they factor into the business. This will help with labour recovery which enhances your P&L report. Using Time and Attendance in your business will naturally be an advantage, because it records when staff are doing their work. This data can be saved biometrically to ease the burden of manual checks. Accentis Enterprise is fully-integrated with Aussie Timesheet hardware to provide a perfect solution. As a business grows from a micro to small and into a small to medium-sized company, these responsibilities grow and need dedicated staff. Depending on the size, the role itself, and the requirements of the business will determine how these modules interact. 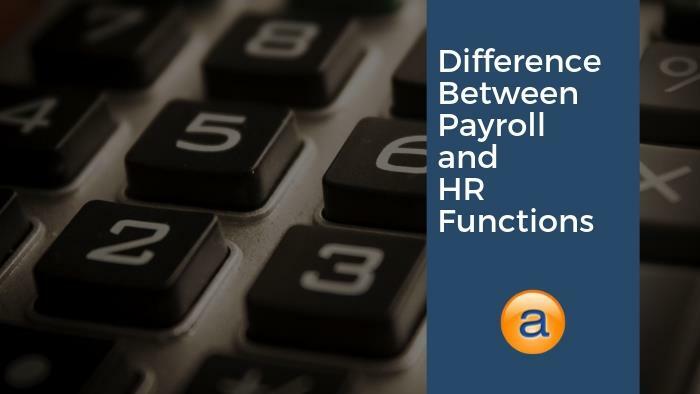 Navigating the differences between Payroll and HR functions may be confusing from the outset. As a business grows, the roles will change and develop, increasing in workload and knowledge. It’s important regardless of the business size that HR, Payroll and financials are able to work together, sharing data and information as the needs arise. Using Accentis Enterprise, sharing data and having it available when needed is a seamless experience. No more printing out complicated reports or having to import spreadsheets before you can actually use the information you need. Accentis Enterprise offers small to medium-sized business relief from multiple software products that only complicate your work day. By using a seamless data-sharing solution that solves many of these roadblocks, your business will run more efficiently and be more productive. What’s complicating your Payroll and HR roles within your business? Start a conversation with us so we can help you.